With the World Junior Championship just days away, the Sabres and Pegula Sports and Entertainment have released additional details on the attractions they’ll be offering to fans outside the 31-games at HarborCenter and KeyBank Center. Chief among them is the Championship Village which will occupy space in Canalside directly adjacent to HarborCenter. Dotting the cobblestone streets will be a large, enclosed tent sponsored by Labatt Blue, a warming area sponsored by Zippo, food trucks, a sledding hill, frozen jerseys, a hockey skills area and some sort of snowglobe attraction. It’s a nice offering even though it appears a little thin when viewed on the map tweeted by the main PSE account handling the event. A little over a week ago I heard that some action could be happening at the foot of Washington Street. The dominoes began to fall today as the Pegulas are reported to have the Hi-Temp Fabrication building at Illinois and Perry under contract. Pegula’s purchase of the building throws his hat back into the Arena District development ring as it would be surprising if he didn’t have plans to renovate the five-story warehouse. While any talk about plans would be speculative, it’s my understanding that Pegula had been chasing this building for quite some time as a home for the Sabres offices. So unless plans have changed, I’d bet on the organization following that track. The countdown to the 2018 World Junior Championships in on. We’re just about two years away, on the nose, from the start of the tournament which will culminate in early January 2018. That’s two full years before the eyes of (most of) the hockey world are directed on Buffalo. Two years to plan and two years to prepare the city. Based on Buffalo’s previous run as a host in 2011 and subsequent USA Hockey and IIHF events hosted in Buffalo, it’s clear that the Sabres organization has their ducks in a row when it comes to hosting international events. I have little doubt that the efforts made by the Sabres will eclipse the work that made the 2011 tournament a success. The biggest area of opportunity, in my opinion, is how the players, media and fans who are converging on Buffalo will feel about the city. Two of the more infamous moments of the 2011 tournament were the criticisms leveled by European journalists and Emerson Etem of Team USA. Etem’s comments on the city brought boos from the home crowd whenever he touched the puck in following games. Having home fans boo one of Team USA’s own was terrific. Episode 4 of the Building Buffalo podcast touches on the 198 and the state of other major roadway projects that are in need of attention around WNY. We also discuss how the best integrate the Buffalo Zoo into Delaware Park in order to allow for future expansion of the Zoo itself. 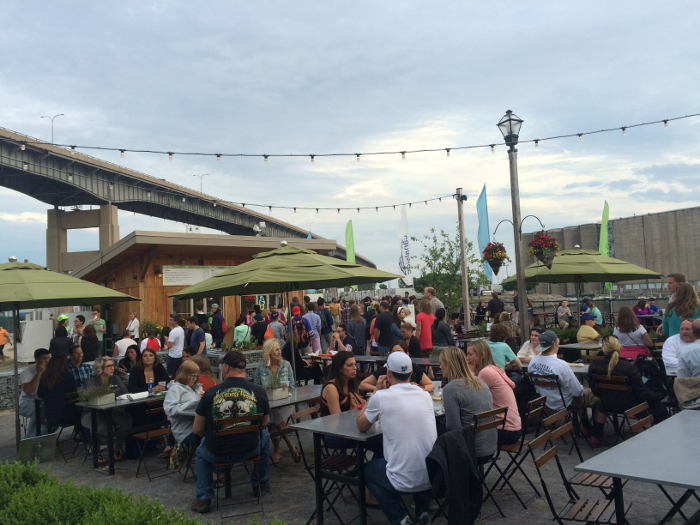 Lastly, we talk about the recent news about Canalside and the need for immediate action in that district to ensure Buffalo’s most prominent entertainment district sees actual development this decade. In episode two of the Building Buffalo Podcast, Tom and I discuss the gondola project that has been gaining press and momentum as of late and the need for greater focus on projects throughout the city that need more attention. We also spend some time talking about the negative impact obstructionists have had on progress in WNY and where we’re headed despite the actions of a loud minority.